I just finished this painting. It was painted in acrylic on canvas and measures 32” x 48”. The painting is about Christ’s suffering during His crucifixion, focusing on His scourging which is recorded in Matthew 27:26, Mark 15:15 and John 19:1. Pilate ordered Jesus to be scourged as a prelude to His crucifixion. Christ could have received up to 39 lashes. I did not include a pillar or column that Jesus would have been tied to. I mainly wanted to show the stripes. My research on the whips the Romans used at that time seemed uncertain, so I painted something similar to what I thought a cat-of-nine-tails would have looked like. I simply made it up, painting sharp pieces of shells tied to the end of the leather cords, having nine of them. 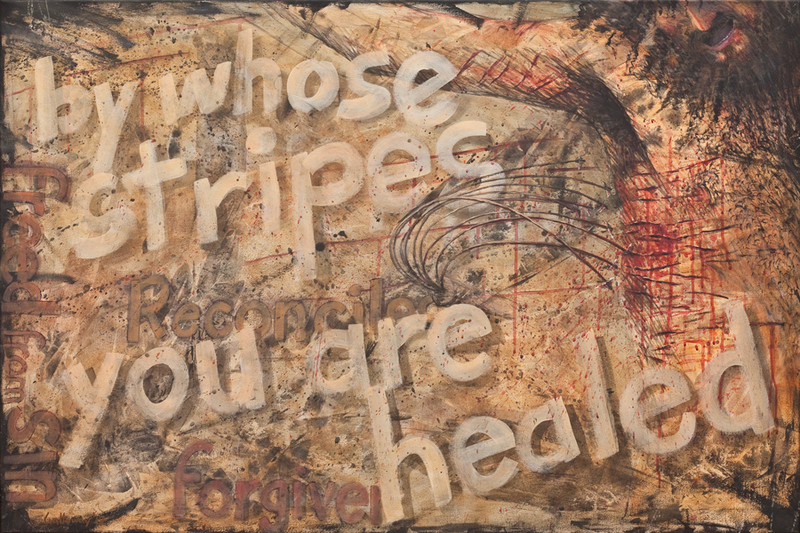 Isaiah states in 53: 5, “And by His stripes we are healed.” Peter in 1 Peter 2:24 seems to be quoting Isaiah, “Who his own self bare our sins in his own body on the tree, that we, being dead to sins, should live unto righteousness: by whose stripes ye were healed.” Our ability to live unto righteousness was won for us by these stripes. Christ’s death on the cross sets the stage for our ability to receive Him. Romans 5:10 states, “For if, when we were enemies, we were reconciled to God by the death of his Son, much more, being reconciled, we shall be saved by his life.” Being reconciled to God occurred because of Christ’s death, which would include the spilling of His blood during His scourging. In fact, Christ lost most of His blood during His flagellation. During scourging, the amount of blood loss would lead to hypovolemic shock, which is why it was a prelude to crucifixion. It was part of the overall act of dying by crucifixion. 3. He was the Lamb that Abraham told Isaac that God would provide in Genesis 22:8. Hebrews 10:14, For by one offering he hath perfected for ever them that are sanctified. Yes, by His stripes we have been healed, made whole!